Jharkhand has the reputation of being India’s biggest producer of lac, a scarlet-coloured resin secreted by an insect on trees. The state accounts for more than 50 per cent of the country’s lac produce. In 2004-05, Jharkhand produced 10,780 tonnes of lac. This season, from March to October, traders were expecting 2,500-3,000 tonnes, said Pawan Kumar Sarogi, chairperson of a panel on lac-based products in Shellac Export Promotion Council, a traders’ body in Kolkata set up by the commerce ministry to encourage lac export. Much of the demand for lac comes from the defence industry, for making ammunitions. It is also used in airplanes, furniture polish and perfumes, and in making bangles, imitation fruits and flowers. About 40 km from Gumla is a lac collection centre, Rihidi. At least 9,000 kg of lac was traded in Rihidi in 2007. According to estimates by the market committee, about 500 kg was traded till September this year. “This is unusual,” said Pradip Kumar Gupta, a lac trader in Gumla. “In the past two years my trade has shrunk by 70 per cent,” he added. Gupta, who has been in the trade for the past three years, is unable to find a reason for it. Lac production is declining in other states as well, including Chhattisgarh, Madhya Pradesh, Maharashtra and West Bengal (see ‘Lac production in India’). The situation is so grave that India has to turn to Thailand—its biggest competitor in the global market—to import broods of lac insects, and lac in the form of final product. The current rate of lac is Rs 400 per kg. Since 2008, entire colonies of lac insect, Kerria lacca, have been dying during the reproductory period. The reason for the mass deaths is uncertain. Some say it is change in climatic conditions, others blame a parasite. Kumar Sarogi of the export promotion council held weather changes responsible for the reduced lac production. According to this school of thought, if the weather is not favourable there may not be enough insects to infest the next crop. “During March and April, the heat is unbearable. This excessive heat makes the resin melt, killing the newly produced baby insects,” explained Kumar Sarogi. Y D Mishra, a retired scientist from the Indian Institute of Natural Resins and Gums in Ranchi, believes an internal parasite is eating the insect. “The parasite has always lived inside the insect and that is why it was never perceived as a threat. It is destroying colonies of the insect at the time they reproduce,” he said. So far the parasite, Afrosticus purpurious, accounted for eight per cent of the damage, but now it has gone up to 50 per cent. Since it grows within the lac insect, insecticides cannot be used because they will kill the parasite along with its host, Mishra added. The rate at which lac insects are dying is high which makes it difficult for poor farmers to continue investing in broods to infest trees. So they give up lac cultivation, said Moni Thomas, a senior scientist at Jawaharlal Nehru Agricul­ture Univer­sity in Jabalpur in Madhya Pradesh. Thomas has been involved in promoting lac cultivation since 1997 (see ‘Steep lack’, Down To Earth, May 15-31, 2004). “Mostly, it is tribal communities and farmers with poor resources who take up lac cultivation,” he pointed out. Despite rural people’s dependance on lac, the government does not have a support price. This leaves producers at the mercy of traders, Binju Abraham, a grassroots worker with non-profit Pradan in Ranchi, said. 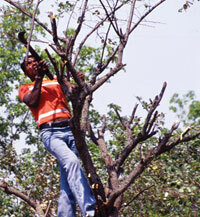 The number of host trees in Jharkhand can produce 100,000 tonnes of lac, according to Mishra. “Jharkhand alone can meet the whole country’s demand for lac,” he added. In India, two strains of the lac insect, Rangeeni and Kusmi, contribute to the production. The Rangeeni strain is the one getting destroyed, said Abraham. To revive cultivation of the insects, Abraham has asked the National Bank for Agriculture and Rural Development to experiment with the Kusmi strain though Rangeeni is more popular. The government is yet to respond. Abraham, along with volunteers from Pradan, has helped farmers in Jharkhand by transplanting broods of lac that survived the previous season on different trees. Mishra and his colleagues are working in three districts of Jharkhand on different techniques to kill the internal parasite. The project started in October this year. The scientists have adopted 100 trees each in every district. They are using cheap easily available materials, like camphor and eucalyptus oil, for fumigation. These materials are plastered on host trees. Another method includes sindhwar, a tree in Jharkhand. It is burnt with cow dung cakes to produce enough smoke for fumigation. I need the information about lac production.i.e. what is the procedure of lac production,what is the best season,what are the best host trees, from where i can collect the lac for harvest. We are going through a recession which isn't as bad a the depression. Unlimited! Excellent article. Very well written, and accurate.